I have it on good authority that I will see my Ueno car this week , and that the Gulf McLaren is 4-6 weeks away from landing on our shores. Last edited by JohnnySlots; 02-01-2016, 10:20 AM. Yeah, I saw that the Ueno was available across the pond. I'll have to snag a Gulf when they're available over here. Ernie brought the Ueno car into Mini Grid tonight. Beautiful! Darker then a thought, but very striking! The car also comes with smaller front tires in a bag under the case. Ernie says this is likely the only car he's doing with the mid-mounted headlight beams. I have just received my Ueno Clinic car: it's a beauty! I mean like: IT'S A BEAUTY! The paint and tampo is pretty much as good as it gets. My example has no blemishes and no minor mechanical assembly defects either. The front tyre rub issue is well documented so no surprises. Ernie has gone so far as to include lower profile front tyres but I will be tweaking the car to retain the original tyres with the markings on them. 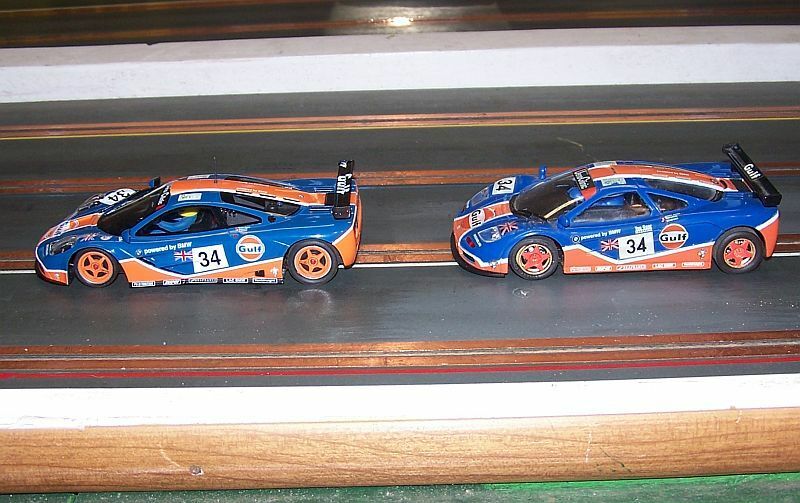 I will be prepping the car this week for our weekly Friday races: nothing that I have seen makes me doubt that this example will be as rapid as my first orange-coloured one that is now running in the Canada proxy. 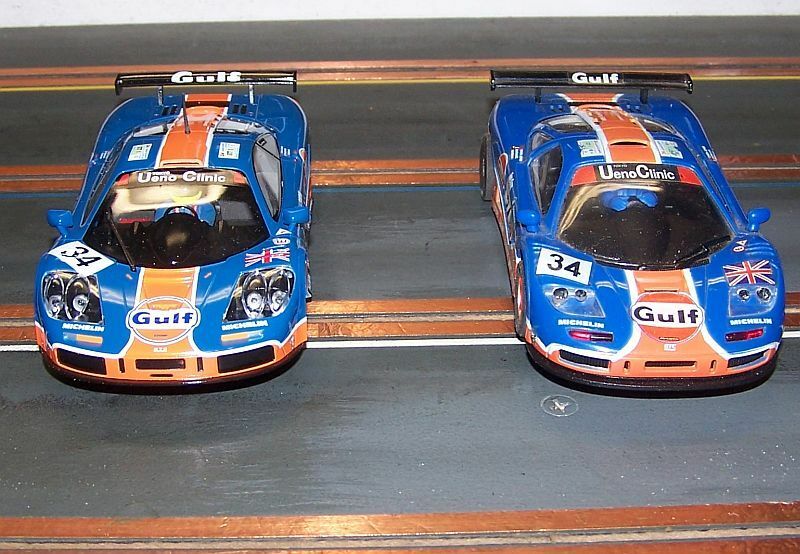 OK, I preordered the Gulf car but I forget from whom. Will I get an email when it arrives? Or will I be billed and sent the car automatically? "you are charged the full amount for the pre order." and then you just wait with no word. so I'm not doing that any more. I think I pre-ordered from 132slotcar.us and they didn't bill me at the time. sorry we have not received the latest McLarens here yet. Probably my fault, as only so many hours in the day. We will be receiving them in soon. Well it finally arrived and mine is hopefully on it's way to it's new home in Florida. I got mine today. Thanks Alan. Very pretty. And the Gulf car is now here. Mine came today from Professor Motor. I had preordered it long before either of the models with a factory livery was released. I got an email late last week informing me of its availability so I could confirm or cancel my order. I was charged only after confirming my order. 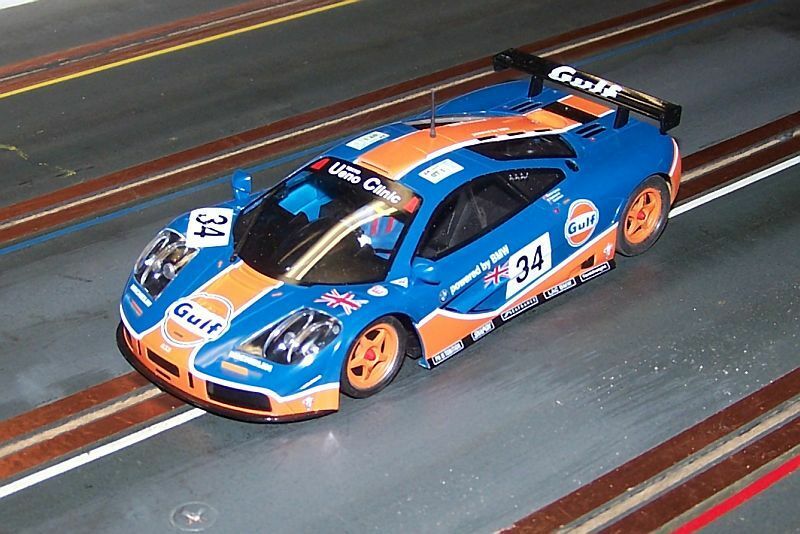 The F1GTR is my favorite super car and the Gulf livery is my favorite paint job. Looks wise this car is excellent and a joy to behold. There are some differences between this car and the one produced by Ninco. They are both supposed to represent the #34 car. Most noticeable is the scoop on the roof. 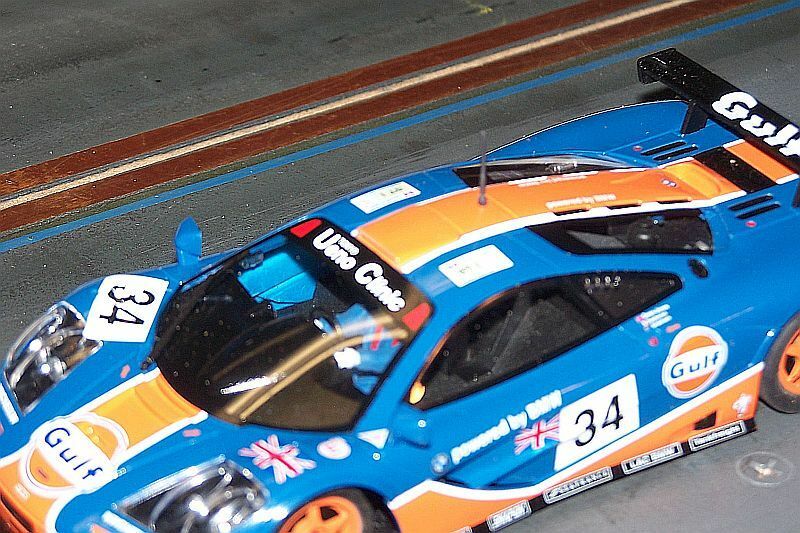 The new MrSlotCar has a piece added to bring the opening to just behind the windshield whereas the previous releases have the opening midway back on the roof as well as the Ninco F1GTRs. I looked up images of the real cars and to my surprise I found images with the scoop in both locations on the #34 car. 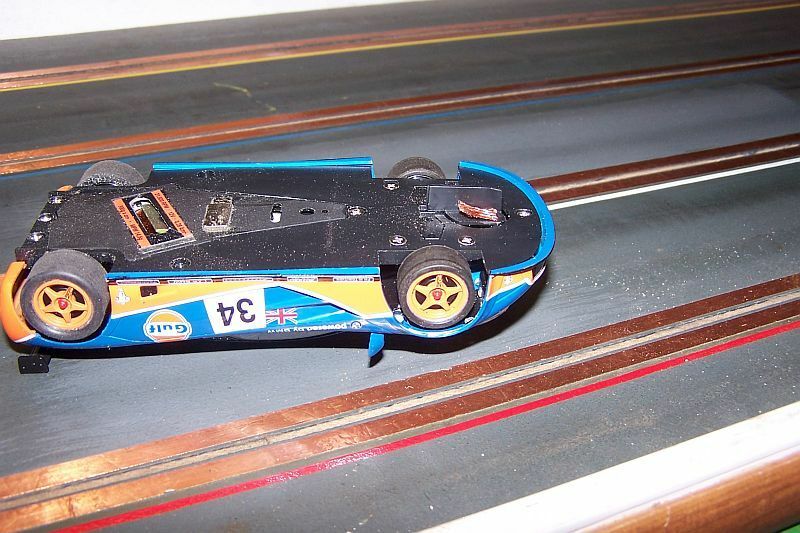 I didn't count any slot car images. There is also a difference in the headlight covers. In this instance I don't know which style is correct. 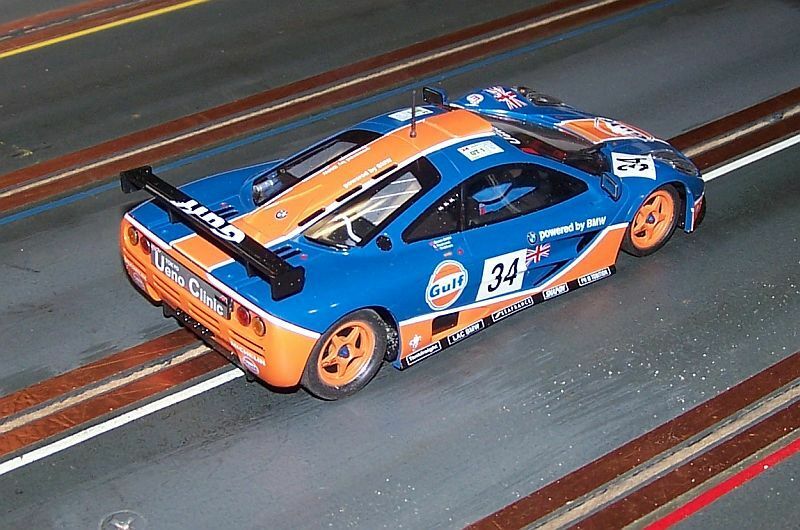 It is very likely that during this car's racing career it had both styles as with the scoop. There is a difference with the sizes of various logos on the cars but that isn't a big concern to me. Now to the running ability. Unfortunately my car would not run as it came out of the box. The front tires wouldn't roll. I removed the body and they rolled as expected. It became clear that the tires were pressed against the insides of the wheel wells. The car comes with grub screws that needed to be inserted in the top of the axle carrier on both sides. But even with the axles adjusted as far down as possible while still free rolling they still rubbed the inside of the wheel well with the body attached. I stole a pair of ultra low profile front tires from one of my slot.it McLarens and everything rolls free. Later, when I was shooting the pictures I noticed something that I think may have been causing the problem. Apparently the front body mounting post is too short. The sides and front of the body extend below the level of the chassis. I might go back, add a spacer and see if the original tires will work. I hope that I have the only car with this problem. If someone just starting out and without the resources at my disposal gets one like this they will most likely be very disappointed. One other thing to note, the wrapper on the motor was very loose and was dragging the track. The easy fix is to remove it but that may disqualify the motor in some clubs. I rewrapped the can making sure it was stretched tight and pressed firmly to the metal. I love the car and when the problems are corrected it runs great but I think the workers at the factory need tighter supervision.